Let’s get specific in our discussion of the Edmonton Oilers defense and focus on the right side: particularly, Justin Schultz and Jeff Petry. Both defenseman are restricted free agents now and the Oilers will need to make some decisions regarding what to do with these two right defenders – whether to re-sign them, how much to sign them for, how long to sign them for, etc. Both Petry and Schultz clock in at over 20 minutes of ice time per game on average; whether this time on the ice is always a high-intensity period or not, it remains that they can get out there and stay out there for a respectable chunk of time. They’ve both had ups and downs over the course of their time with the team, but let’s be real – out of a really awful defensive line in Edmonton, they’re probably the Oilers’ best shot, as things currently stand. So do we keep both? Keep one? Keep neither? I would vote for signing both; it might cost a little bit more than the Oilers want, but Schultz and Petry are comparatively solid defenders who at least know the organization well. They’re accustomed to playing with the core forwards and predicting their movements on the ice, which is pretty big for a team that’s taken a bit of a revolving door strategy as of late. There is definitely room for new additions, but those additions could potentially be used to complement these two. 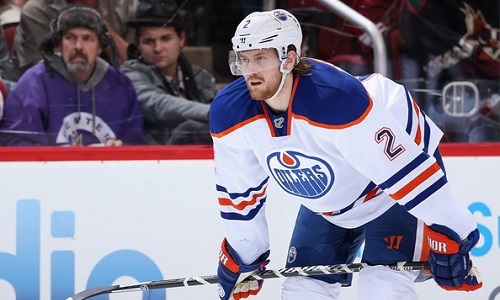 Petry in particular is useful – the Oilers already have a lot of youth, and while he’s not exactly over the hill at 26 years old, he’s still older than a lot of the 20 year olds who are just sharpening their skates in preparation. The Oilers in particular have a lot of young players with great potential who are still sort of getting their bearings, and a little experience could be very helpful. Petry is a somewhat polarizing figure, and some question his ability, but let’s face it – he hasn’t exactly had diamonds to work with. While he did quite well with Smid, he’s been put in the role of babysitter for countless rookie defenders who cycle in and out of the organization, and defensive partners who just don’t mesh on some level. If he were paired with someone with a high level of skill and experience, I really do think Petry could be great. He could serve as a good anchor on the defensive line, someone to provide solidity while they bring in other defensive players who may be a bit less expensive. The Oilers will likely sign him to a fairly short contract, perhaps a year or two, but if they want him to stay in Edmonton for much longer it’s crucial that they find a legitimate pair for him. Schultz is a little trickier because of his youth – he’s still growing into his self as a player, and like Petry, he’s suffered from some pairing issues. For awhile it was the duo of Schultz and Schultz (Justin and Nick), and then Schultz and Ference. Ference, while he has been struggling a little bit with the Oilers since getting signed a little while ago, previously did play on a Stanley Cup finalist team during his time with the Boston Bruins. It’s uncertain whether their incompatibility is something to do with Schultz, or just that they don’t play particularly well together. Schultz definitely needs some time to truly come into his own as a defender, but Edmonton is so weak on defense that keeping him might be a consideration. Both Petry and Schultz are promising as right side defenders, but their future is fairly dependent on who the Oilers manage to pair them with, and whether the Oilers decide it’s worth paying a bit more to keep them vs. acquiring some newer defenders with a lower price tag and even less experience.